WOW! This may have been the biggest turnout I have ever seen for this and I�ve been going for the last 6 years. I am a ranked player and live nearby Akron, OH so the Ohio Pinball Show is always a must for me to attend. It's held at the Emidio Expo Center which is a nice sized open area. Emidio's is an Italian restaurant across the street and they sold pizza there during the event. I arrived Friday at 1PM. The first thing that you could not ignore once you walked in was a Hercules, the largest pinball in the world, working very well! The tournament pin was Elvira�s Scared Stiff. People were still setting up but there were roughly 100 pins there. The Medieval Madness and Attack From Mars with the color DMDs were there and looked great. AC/DC and Transformers pinballs were both there. Many pins like Spiderman were decked out with LED lights and some had them flashing from the bottom of the machine which was really cool. Lots of games and lots of people but PLENTY of space! Marvin and Mike take a second for a photo and then back to the show I also enjoyed playing a rare Pistol Poker, a 1973 King Pin, Fish Tales, Time Warp, a great working Meteor� there was just a great mix of games for young and old to enjoy. Mike Pacak always amazes with his great collection of games and this year he surprised us with Bugs Bunny Birthday Ball. Jersey Jack Pinball were there and gave a great presentation. Whizbang Pinball was also there with Whoa Nellie!. I bought some cherry wood "footies" with felt bottoms for 1 of my pins and they look great. I own 2 pins - Lost World and X's and O's. I also found some X's and O's bumper caps in a bin that was a great find! I then went to enter the tournament in the A division. Scared Stiff was set up rather difficult to avoid people playing all day. The crate shot took 12 hits to open, there was no rubber at the outlanes and the tilt was super-sensitive with no warnings. I found that out the hard way when I tilted during multiball and I DON�T tilt. I scored 8,975,000 and it led the event at the time but I knew it was early. I was comfortable until after 5:00 when I saw Andy Rosa, Trent Augenstein, Derek Fugate and other highly ranked players show up. I�ve been very fortunate to get to know and be friends with so many great people through my league and tournaments I attend. My buddy Don Johnson posted 13,000,000. Trent posted 33,000,000. My score was dropping fast. I am a member of the Buckeye Pinball Association league and we gathered and had our league night there at the show! When I showed up Saturday around noon with family, I was in 12th place. Uh oh... maybe I should play some more. I bought some more entries knowing I needed 10,000,000 at least. Thanks to a flurry of jackpots during Coffin Multiball, I had a game of 10,100,000. It made 8th place at the time. When tickets stopped selling at 3:30, I was in 9th place. Andy Rosa would achieve 41,000,000. Most of the players playing at that time were already ahead of me, playing to improve their position. However, there were still many people waiting in a long line to play � it really was a great turnout! I decided not to enter any more and cross my fingers that my score would hold out. It didn�t. I think it took 10,700,000 to qualify. I�m going to have to head out to more events now to get my ranking points! The big guys play the big game There were other fun tournaments at the show too! Marvin and Justin Ortscheid helped coordinate some free mini tournaments. One was a kid�s tournament where my 6 year old nephew Evan Lawrence finished 1st and my 8 year old daughter Jessica Lawrence finished 2nd and they were both thrilled. It was a great weekend and proved that pinball is still alive and well in northeast Ohio! 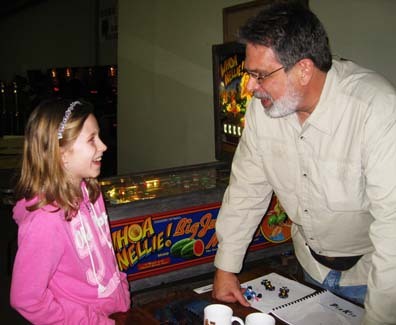 The 2013 edition of the Ohio Pinball Show starts off March Pinball Maddness on the first weekend of the month but it's not too late to make plans to attend. Check out their website by clicking OHIO. Dennis with "more Scared Stiffs than I've even seen in one place - and a special "guest" who specializes in getting guys scared stiff. Author Rod and daughter Jessie at home.